Art and About… of Dogs and Their Artists. …… of dogs and their artists. From large shepherds to small bichons, dogs are a most visible part of life in the Ojai Valley. They seem to have a particularly important place in the physical and emotional geography of artists’ studios. Dogs provide protection. Literally and spiritually. Indeed they are, as Milan Kundera put it, “our link to paradise. They don’t know evil or jealousy or discontent.” Artists are isolated by the nature of their work, often self-absorbed, and sometimes affected by the stress or anxiety of not knowing where their creative flow is taking them. A dog’s rhythmic breath and physical ease, its ability to be in the here and now, can be a great comfort in the studio. Dogs are physically grounded and emotionally grounding. A cold, wet nose brings instant re-connection with reality! Dogs teach artists to be playful yet patient, spontaneous yet quiet, detached yet fully present. It is no wonder that some Ojai painters have devoted much of their creative attention to painting their cherished companions and accommodating models. When I asked Linda Taylor why most artists prefer dogs to cats in the studio, her answer was prompt: “Dogs don’t walk on artworks!” In her case, having paw marks on her exquisitely executed prints would be a no-no. She finds that playing with her dogs (Oreo, a male Australian shepherd, and Libbey, a female Australian cattle dog) relaxes her and helps her find resolution with her art. 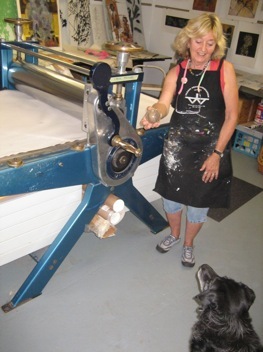 Linda Taylor playing ball with Libbey in her printing studio. 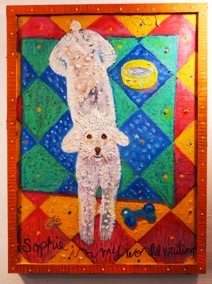 Kate Hoffman is an accomplished painter of animals, horses, dogs and cats. She prefers older dogs: “They are quieter and easier to paint.” She likes pictures of sleeping dogs; they remind her of people. One of her favorites is Andrew Wyeth’s painting (“Master Bedroom”) of a yellow lab peacefully sleeping on a bed, curled up against the pillow in a soft light. 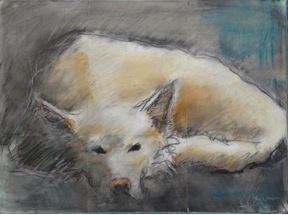 Kate’s rendition of her samoyed-wolf mix, Tofu, echoes a similar sense of comfort and relaxation. As a painter, she is always looking to simplify, and she captures the essence of her subjects, a fine line moving at the intersection of the human and animal kingdoms. Dianne Bennett experiences the animal world with the warm, keen sensitivity manifested in her brilliant paintings and retablos of birds, turtles, coyotes etc. As she tells her stories with colorful vibrant images, clearly there is a love and reverence here for the whole world of nature, a deep and joyous connection among the full spectrum of all forms of life. 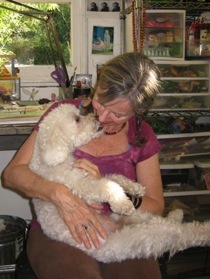 With Sophie, her white poodle, cuddled snuggly in her arms, Dianne speaks about dogs with gentle tenderness in her voice. “A dog’s needs are very simple: they will be there, sit and wait for you,” she said. “Art making is a solitary endeavor. Sophie, like Jackson before her, is my muse and constant companion while in my studio. Her presence, watching and waiting, provides inspiration and connection that calms me and supports my creative flow. Pablo Picasso had many dogs in his life, and apparently they went everywhere with him, although he often left women and households behind. 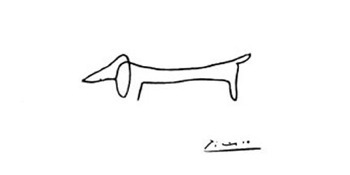 Picassoâ€™s masterful use of the simple line drawing catches the essence of his beloved Lump in “The Dog.” His sketches of Lump, like those of his toros, are among his most famous drawings. 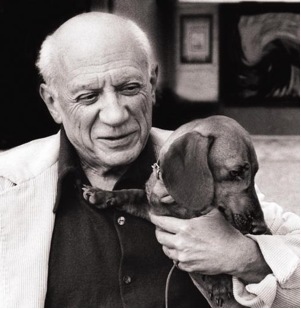 As for the photographs of him embracing Lump, tight and close to his heart, I canâ€™t recall any other picture of Picasso where his whole body seems to surrender into such a soft smile. Dogs do have that effect on people, even on the most moody of masters. Charles Schulz, of Snoopy fame, summed it all up: “Happiness is a warm puppy.” And we all know he was an authority on dog matters. As for other illustrious dogs and their famous masters, one must at least mention David Hockney and his inseparable dachshunds Stanley and Boodgie; William Wegman’s photographs of his Weimaraners (Fay and her brood); Andy Warhol and his dachshunds Archie and Amos; Pierre Bonnard’s black poodles and his dachshund, Pouce; and Lucian Freud’s haunting portraits of his beloved whippets Pluto and Eli. Dogs do not speak (or do they? ), so we must want to listen intently and observe their body language to hear their voice. These furry friends are humble yet quite effective teachers to humans on matters of unconditional love, trust, wisdom, playfulness, patience and animal instinct. Â Joyful and attentive companions, they bring all that and unaccountably more to the lives of those willing to open their eyes and hearts to their soulful presence. The bond is powerful. Â In an artful portrait, it is made visible.